The photo was taken on March 15th 2012 at shortly after sun up. The "Take It!" came from my being in no rush taking random shots with the initial objective being to use the combination of the memorial to the Merchant Marines with its surrounding flowers which has always been an annual favorite of mine. As it turned out the flowers that are planted by the plenty surrounding the base of the statuary are tulips which were not yet in bloom. Daffodils can hardly be called the next best thing but were in their peak and right there, so they became our lucky substitute. The After Take: It seems this is a rather peaceful framing of the Washington Monument from across the Potomac River. Nothing put in a powerful prospective, just what one sees as they enjoy the bike and running path that is ever so well maintained on the Virginia side of the river. We may feature this setting later in the year as it is a crowd favorite to view the 4th of July fireworks. In the meantime, I took what was the original intent of a photo shoot to be done on the run and turned it into an almost 2 hour leisurely walk and many takes which would never have been made. I look forward to sharing many of the photos with you as time moves us into this welcome time of year. Here is the hope that you too will have what is in its initial presentation a disappointment, turn into a great experience. One of the big factors that helps in the conversion is to take the time to slow everything down and take another look. Looks good with the Washington Monument dead center. I agree ray this made for a good banner. A beautiful shot! The daffodils are splendid! 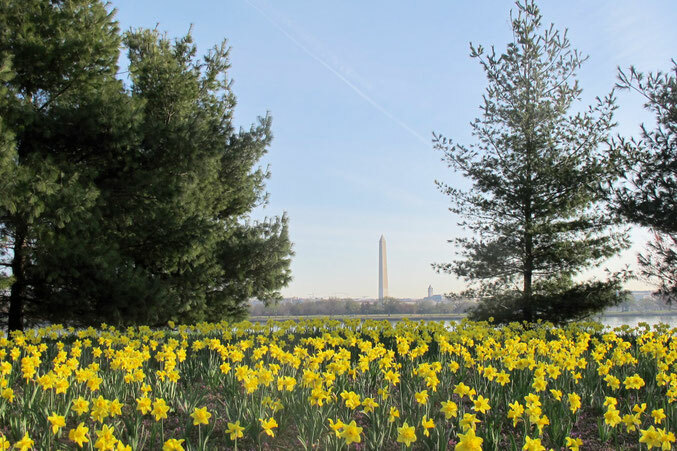 The Washington Monument quietly states its strength from a distance with your beautiful landscape and floral framing.